It’s hard to imagine there’s anything more beautiful than some of Hawaii’s above-ground landscapes. But, below the surface of the ocean, you’ll find an entirely different world — just as beautiful (perhaps even more so) with caves, caverns, and undersea lava tubes, all for you to explore. For those who are proficient scuba divers, exploring some of these underwater caves can be an incredible experience. But, for beginners, diving in and out of some of these sea caves can be highly dangerous. So, it’s important to assess your ability before attempting to dive any of these underwater venues. 1. Spitting Caves, Oahu: According to Reefpirates.com, Spitting Caves is one of the premier drift dives on Oahu. Located along Portlock Wall, the Spitting Caves dive site is a great place for a chance encounter with the endangered Hawaiian Monk Seal. White tip reef sharks can also been seen at this site with regularity. Eagle Rays, large eels, frog fish, and turtles are all common sightings here as well. Spitting Caves has around 5 different sized caves naturally carved out from thousands of years of constant ocean pounding and strong currents. When conditions are good, this is one of the best dives on Oahu. When conditions are not good, diving this area becomes very dangerous. During winter months, you can hear whale song echo off the wall. Only experienced scuba divers should attempt to dive in the underwater caves in Hawaii. 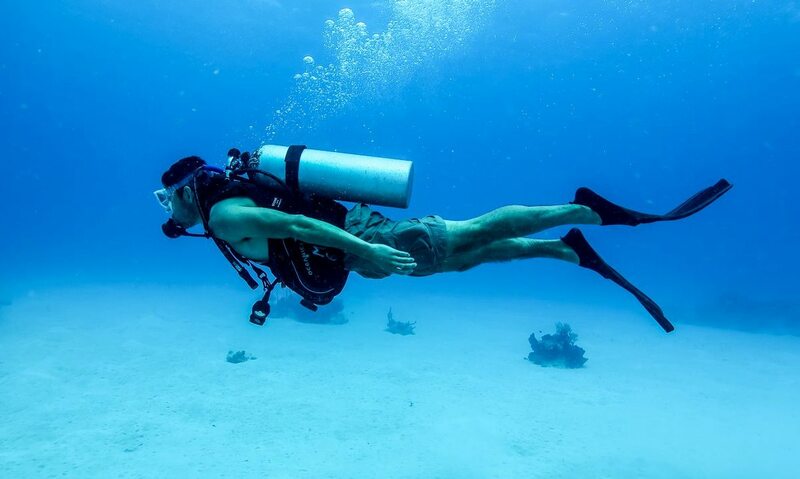 Less experienced divers could get lost or get disoriented during the dive. 2. Bubble Cave, Maui: Californiadiver.com raves about the Bubble Cave on Maui. According to the website, Bubble Cave is a large cave with an air bubble in it (which is actually at surface level) where divers can remove their masks and regulators and talk within it. Access to this unique cave requires an underwater swim of about 50 feet through a narrow underwater lava tube. The entrance is a wide opening that begins at the sandy bottom at a depth of about 15 feet and narrows as you enter the ancient lava tube. The lava tube extends to about 50 feet back (you’ll definitely need flashlights — including backups), then ends in the large cave itself. Here you can surface into the air pocket and enjoy the unique experience of being at the surface, inside a cave. There’s room for about 5 divers inside. 3. Sharks Cove, Oahu: According to Island Divers, Hawaii, there are a couple of sources for its name; the first is from the air, the rocks forming the cove look like a shark. The second is that the cove looks like a shark took a bite out of it. 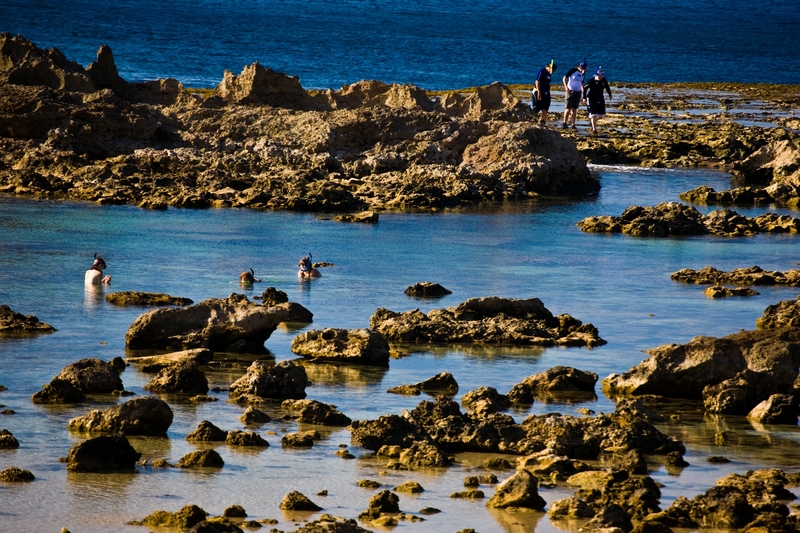 Because of its amazing underwater world, Shark’s Cove is a favorite spot among snorkelers and shore divers. The lava has formed underwater caves and tunnels about 15 to 45 feet below the surface. These caves are a real thrill for experienced scuba divers with lots of arches and open-ended lava tubes, allowing light penetration and easy access. Sharks Cove is a favorite among divers due to its beautiful underwater landscape. 4. Three Room Cave, Big Island: Aggressor Fleet describes Three Room Cave on the Big Island as a 200-foot lava tube with 3 large rooms. One way in, one way out. The dive is set up with line and cylume sticks to follow. Inside the caves there are mole lobsters, ghost shrimp, Hawaiian lobsters, puffer fish and nudibranches. Outside the cave there are frogfish, Reticulated Butterfly fish and turtles. However, this is a dive for experienced divers only — and it should be made only when there are extremely calm seas. 5. Makaha Caverns, Oahu: According to Island Divers, Hawaii, Makaha Caverns located on the west-side of Oahu in Waianae, are formations created by hot lava flowing into the ocean, trapped air in the lava formed bubbles when these bubbles popped the ocean water ran in and cooled off the surrounding lava forming caverns and caves. The overhangs are great habitats for all manner of marine life. The marine life that visits these caverns are green turtles, multiple species of eels, frogfish, leaf fish, occasional reef sharks, and eagle rays to name a few. If you’re not an experienced diver, you can practice your skills at easier dives, such as near Molokini. Book a Maui scuba diving tour through Hawaii Aloha Travel, and you can choose from a 2-tank morning dive or even charter a private boat for your scuba crew. But, if you’re ready for an extreme dive, consider exploring these underwater caves in Hawaii — and find out why our underwater scenery is just as spectacular as that above the sea.